To make money online you'll need informational as well as software products to help you. Each product has been researched carefully to ensure they're honest and scam-free. They've been given good reviews by internet marketers and newcomers alike who have bought them, tried them out and given them the thumbs up. I would appreciate your help on something. I'll be honest with you - I haven't done this for nothing. I can earn a small commission from these products if they are tracked properly. So if you could please set your anti-spyware (if you have it) or browser to allow cookies, it'll make sure they know I sent you. It won't cost you a dime more to do that. Thanks, I hope you'll find this selection useful. If you've been to this page before and found a bunch of Clickbank products designed to help out newbies to this business that sold for pretty high prices, you might be wondering where they've all gone. Well, this page has been long overdue for an overhaul and to clear out all that stuff that is eitehr out of date and no longer relevant or I just don't want to recommend it any more. Just like many newcomers to this business a few years ago, I was sold on the idea of promoting MMO products to Internet Marketers without realizing that every IM'er and his diog was doing the exact same thing. I even made a few sales which made it seem like it could be a good thing to be in. Time and experience have taught me that it is NOT a good thing. Most MMO publications pushed out on Clickbank are little more than re-hashed ideas that have been floating around for many years with little to add to the original teachings and most of it is simply no longer viable. Content is King, as the well worn saying amongst Internet Marketers goes and its as true today as it always was. 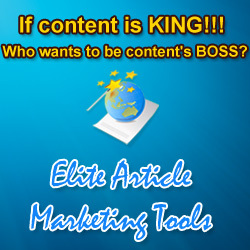 You need to write original, relevant and good quality articles for your main money making website, no arguments there. But what about creating links to point to the deep pages in your site that are promoting the products that you are making money freom so that they rank well in the search engine results? You can write articles to post in other people's blogs if they allow guest posting and you can build out your own collection of websites that are designed to support your main site. This is a lot of writing and in most cases it is necessary if the links you are sending to yoru main site are to be counted as strong, relevant authoritive links. The search engines count quality in articles and they are getting better at weeding out the dross. But there are still times when you need to send out lots of lower quality links to support your sites and web 2.0 properties. This is usually done by creating dozens or even hundreds of article directory links. The problem is you don't want to waste your valueable time writing original articles for these places. They are full of garbage anyway, so you might just as well join the party and post spun articles. If you can't beat 'em, join 'em, right? To spin articles still takes a lot of time unless you are using a good quality article spinning software package. MAR is one of the best on the market and I use it myself, so I know it works and it does save an awful lot of time. Its easy to learn (anotehr time saver) and its built-in synonym database is quick and easy to apply to a donor article to produce a nicely set out spintax version reazdy for spinning. From there, its just a case of hitting a button and you can have as many spins as you need. Obviously, the mnore spins you request, the lower percentage of originality you will get, but even spins of 100 or so can produce 40% or better orignality. Yes this is a Clickbank product and it comes with a suitable price tag, but in my opinion, its worth the cost to save yourself all that time in spinning for article directories. You can Click HERE to get your copy of this amazing time saving software.